10-ingredient vegan pancakes with all the flavor of a ginger cookie and the tenderness of a morning pancakes. Preheat griddle. Prepare flax egg by combining water and flaxseed in a large bowl and letting rest for 5 minutes. Add molasses, pumpkin puree, oil, brown sugar and whisk. Add almond milk and stir once more. Add flour, baking powder and spices to a sifter and sift over wet ingredients. Stir until just combined. Ideally, let batter rest for 5 minutes before cooking. Once preheated, generously spray the griddle with non-stick cooking spray and spoon about 1/2 cup of the batter onto the center of the iron and cook according to your machine’s instructions. I like to set mine to the darkest setting so it gets extra crispy. Once done, remove and place on cooling rack to let steam roll of and crisp up a bit. 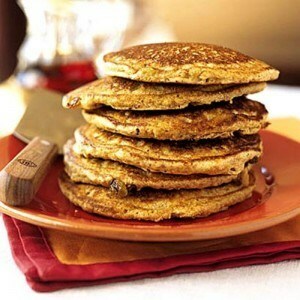 Serve warm with vegan butter (such as Earth Balance) and maple syrup, or whatever toppings you desire.